18" x 15" x 3"
The Butcher Block Acoustics wood platforms are beautifully and sustainably crafted from walnut or maple. They add mass and desirable tonal qualities due to their natural vibration absorption and damping capabilities. They can be used under any audio component and will compliment the aesthetics with their gorgeous finish. They are available in Walnut & Maple End grain or Edge grain finishes, and finished with a Hand-sprayed “furniture style” Durakryl 102TM - state of the art non-toxic urethane finish that is VOC-free. The edges are squared for a clean look. If you need inserts installed and recesses cut for Stillpoints or other audio footers, shoot us an email or give us a call to discuss possibilities and costs. SUSTAINABLE HARVESTING: Our forest stewardship team manages company-owned tracts of land. With sensible harvesting and managed re-growth, we give back to the land what we take. CARBON NEUTRAL FOOTPRINT: There is no increase in carbon emissions due to the manufacturing of Butcher Block. The carbon released by our product, when finally disposed of, equals only what the tree would have released in its lifecycle. NO WOOD WASTE: The scrap and sawdust generated in the production process is burned to heat our manufacturing plants. MINIMALLY PROCESSED: Relative to many complex highly processed materials, solid hardwood Butcher Block requires less energy to produce. VOC-FREE FINISHES AND ADHESIVES: Our state-of-the-art finish and formaldehyde-free glue produces no Volatile Organic Compounds. ELECTRONIC GLUE PROCESS: RF Cured GREENGUARD® Certified PVA adhesive has increased the speed of the laminating process (only 90 seconds) and has resulted in a strong “weld” and healthy wood. AIR DRIED, THEN KILN DRIED: After spending a great deal of time air drying, our hardwood then spends a short period of time in the safe and controlled environment of a kiln. Moisture content is key - kiln drying is a scientific process that SLOWLY removes just the right amount of moisture from the ENTIRE piece of wood – edges and center. KILN DRIED HARDWOOD USERS: Steinway & Sons, Yamaha, Martin, Gibson, Fender, Rickenbacker all turn to the safe and scientific process of kiln drying. Professional kiln drying does NOT weaken the wood’s fibers. OLD GROWTH HARDWOOD: Old growth hardwood of the eastern United States can develop old-growth characteristics in one or two generations of trees, or 150 – 500 years. Be skeptical about what you read regarding old growth maple. 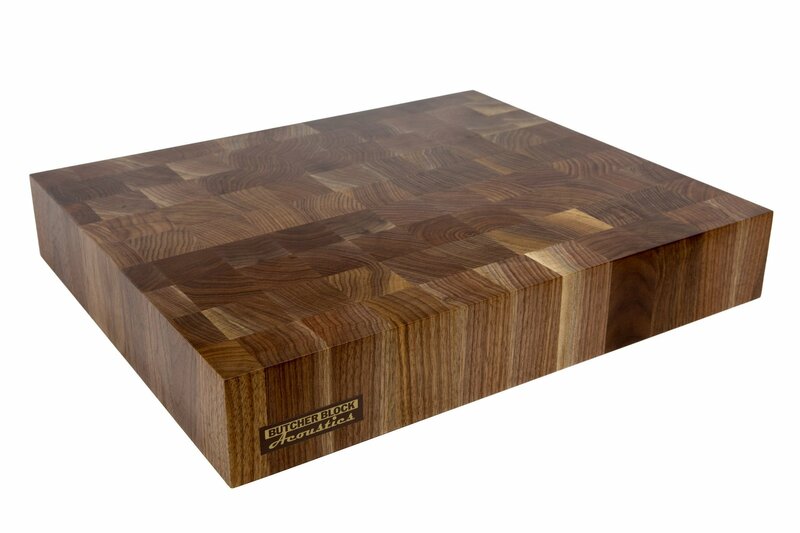 Click the button below to add the Butcher Block Acoustics 3" Walnut End-Grain Platforms to your wish list.